What Is a USP and Why Does Your School Need One? What does your school offer that no other school does? Take a second and really think about your answer. Is it relevant to your target audience? Sure, you might be the only school offering classes on surviving a zombie apocalypse or tree climbing, but chances are your course offerings, schedules and amenities look a lot like your closest competitors. And these days, that competitive set is growing each enrollment season. From career training and trade programs, to public or private universities and fully online degrees, students have more choices than ever when it comes to education. “Access to information plays a huge role,” shares Parker Antoine, senior administrator of marketing at Orange Technical College. “People have a lot more resources to learn what it’s like to go to a school now than they did 10 years ago. The biggest difference for students nowadays, they really don’t have to choose either or. They don’t always have to choose between a four-year degree and technical college,” Antoine continues. So, how can your institution stand out in a sea of options? Defining your school’s unique selling proposition is a good start. Effective USPs are focused, clear and brief, which means many brands use them as a tagline, slogan or part of a marketing message. In short, they communicate what your school does better, or more of, when compared to others. If you’re at the helm of an institution without a clearly defined USP, here are three steps to guide the process of identifying and writing one. Step one in almost any marketing strategy is figuring out who you’re marketing to. Whose information do you want to see on an application form? Create a persona for your ideal student that covers their demographics, but also their pain points, needs and goals. What is their deciding factor for choosing a school? What sticks in their minds when touring campuses or browsing school websites? When creating your student persona, remember to be specific—we’ll revisit this later in this post—the more detailed your persona, the easier it will be to identify and write your school’s USP. 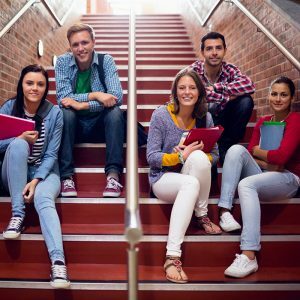 This part gets a little trickier if you’re marketing to multiple generations of students, so you may need to create more than one ideal student persona. Knowing what your audience wants and needs is only step one. Next, you’ll need to dig into how your institution can help your ideal student address their pain points, meet their needs and reach their goals. This may call for a bit of introspection—why is your school the right choice for that student? How can you help them in a way that others can’t? For some, that answer may be simple. For others, particularly institutions in a saturated market, it may feel as if everything has been done before. That just means you’ll have to search a little deeper. There are details that make each school stand out, from professors who give up their weekends to host study groups to on-site childcare both in the daytime and evenings. Don’t be afraid to go into the trenches and get to the core of what makes your school—and those that keep it going—unique. At this stage, it’s not enough to simply say, “We care about your success.” You must share the how and why you’ve uncovered in a way that instills confidence and empowers students to act. And telling your story is only one piece of the puzzle. You also have to show students what makes you different, both in your marketing and your actions. For Marion Technical College, we translated their USP into emotion-stirring videos focusing on specific career paths and what it means to be a part of that field. In the words of Abe Lincoln, “Whatever you are, be a good one.” A clearly defined USP weaves into every aspect of your school’s marketing and beyond. It embodies the spirit of your school and should be the starting point for your institutions next steps. Do your objectives, plans, curriculum and programs align with your USP?